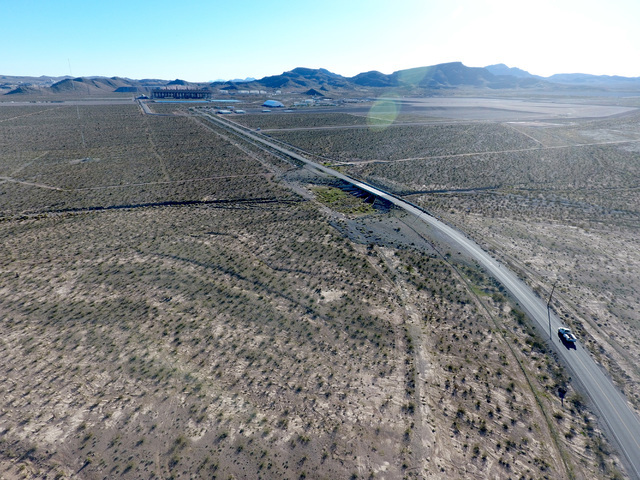 The 18,000-acre Apex Industrial Park could be a catalyst to bringing more “innovative” companies and manufacturing operations to Southern Nevada, adding onto a tenant list that includes Faraday Future and Hyperloop One. Michael Quine/Las Vegas Business Press The Faraday Future field management offices and plant site, as seen from the air on Feb. 14, reside in the Mountain View Industrial Park within the Apex overlay. 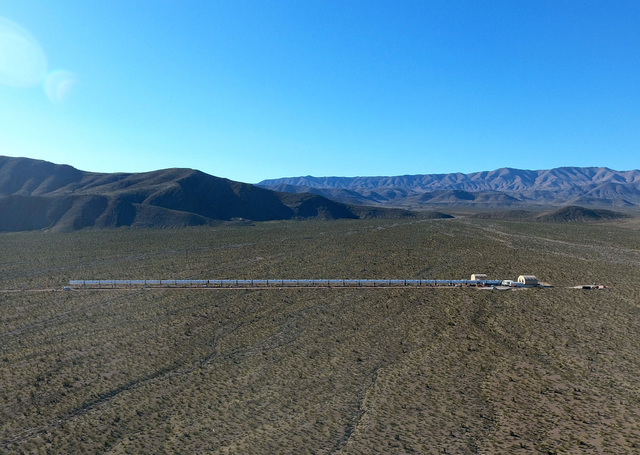 Michael Quine/Las Vegas Business Press A segment of the Hyperloop project, as seen from the air on February 14, is part of the Apex Industrial Park located 30 miles North of Las Vegas. The 18,000-acre Apex Industrial Park could be a catalyst for bringing more “innovative” companies and manufacturing operations to Southern Nevada, adding to a tenant list that includes Faraday Future and Hyperloop One. That was the sentiment from North Las Vegas leaders and a group of experts at a presentation in mid-February at North Las Vegas City Hall, armed with a new report from Urban Land Institute Nevada, the local chapter of an international organization that promotes sustainable land use. “Apex Industrial Park is on its way to becoming a premier facility for developing the next generation of technology and manufacturing, and Apex is poised to become a platform for innovation and the impetus for large-scale economic change in our region,” said North Las Vegas Mayor John Lee at the Feb. 15 event. Robert Lang, director of Brookings Mountain West at the University of Nevada Las Vegas, said Apex is the second-largest industrial and manufacturing site available in the Southwest — and accessible to the regional markets such as Arizona and California. Another attractive feature of Apex is its low-tax basis, the report contended. But Southern Nevada could use a boost in its housing supply and in educating its workforce to fulfill the next generation of jobs that could come to the region. Despite some negatives, the park could be a major boon for the local economy. According to the Urban Land Institute report, when Apex is fully developed, 20,000 direct jobs could be added to the Southern Nevada economy, along with 56,000 indirect positions. Lang suggested that filling these jobs could be a possible feat for the valley. Historically, the area had never before built large-scale megaresorts, though it managed to bring a labor force here to fulfill the orders. Lang also pointed to a large labor pool in the Southwest region, from Phoenix and Los Angeles, that could fill the gap as well, if needed. The report, as did Lang, suggested partnerships between educational institutions and private companies. So far, 1,000 acres are currently under development at Apex at varying stages, according to the report. The ULI study was commissioned by the Las Vegas Global Economic Alliance, an organization that supports economic growth in the Southern Nevada region. “We chose to support this work early on because we believe in Apex, and we see the potential — the potential to be more than just an industrial area but really to be a hub for innovation — a place where we can identify, test and manufacture and distribute the next generation of transportation technology,” said Jonas Peterson, president and CEO of the LVGEA. There have been headwinds made at Apex with the entrance of companies such as Hyperloop One and Faraday Future, though that project is moving slower than originally planned. Faraday Future announced plans to build in phases in the first quarter of 2017, starting with a 650,000-square-foot facility instead of its original plan to raise a 3-million-square-foot car production facility all at one time. Faraday Future had received a special tax incentive package of $215 million before running into financial setbacks. On a positive note, Hyperloop One had a successful test run in 2016 and is on the way to having another test this year. Looking forward, the city of North Las Vegas has plans in the works to build a $185 million infrastructure project, connecting Apex to the city’s water and sewer lines, by the first quarter of 2018.